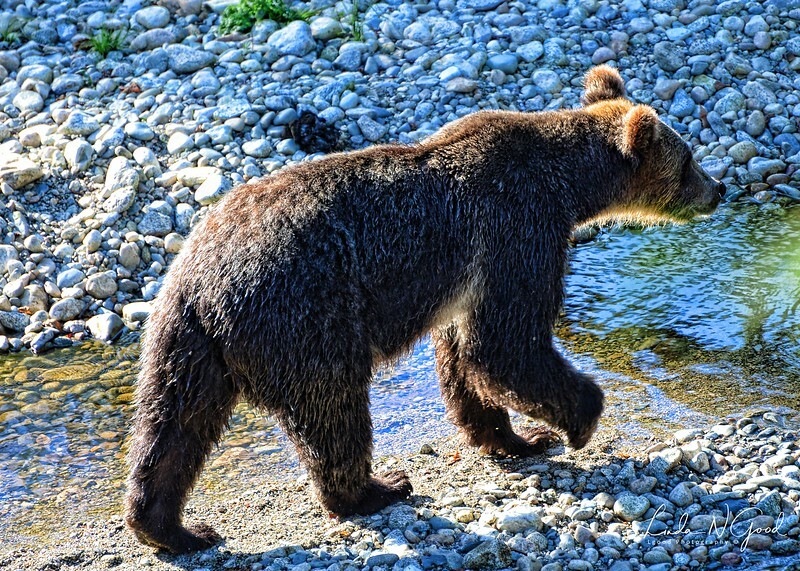 This younger Grizzly had been in the river catching and eating salmon. Then a big, old and very obviously the Alpha male came into that portion of the river. So, this guy got out of the water, and started up the bank to find another hunting ground further up river where he wouldn’t have to deal with the Alpha. This trip was taken about 1.5 years ago, and I’d go back again this year if possible. Occupancy at the lodge is a bit limited and the season for bear watching there is relatively short. The ability to be so close to the bears and watch them in their natural surroundings was very exciting. We had to be very quiet when the bears were near so as not to spook them, and it was oftentimes hard not to squeal with delight when they were so close. Have a day where you contemplate all that is right in your world. You look to be TOO close! Geez, if I were that close, I'd be thinking about an exit strategy instead of an fstop! Nice photo, Linda! He does look young, and I guess he knew better than to get in the "big guy's" way. He gave you a really nice view as he went by. Love this capture of the dripping young grizzly! I would love to see this someday! Beautiful study of this young bear. The light is fantastic.